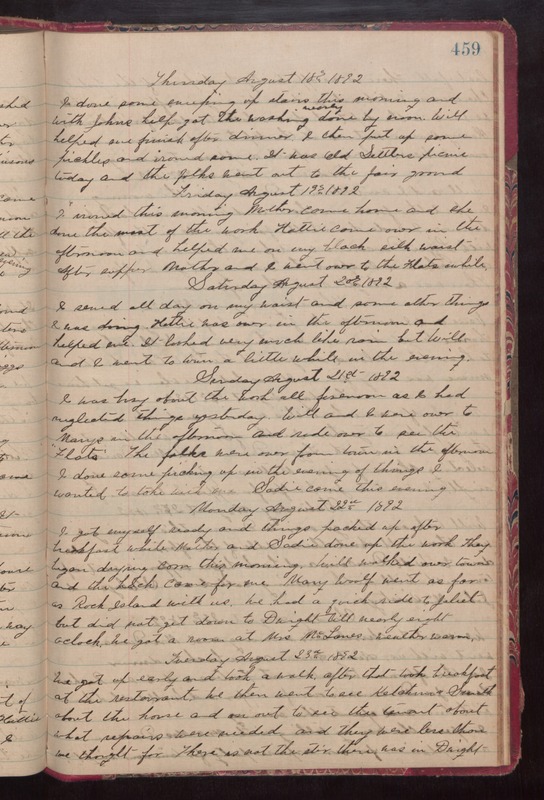 Thursday August 18th 1892 I done some sweeping up stairs this morning and with Johns help got the washing nearly done by noon. Will helped me finish after dinner. I then put up some pickles and ironed some. It was Old Settlers picnic today and the folks went out to the fair ground. Friday August 19th 1892 I ironed this morning. Mother came home and she done the most of the work. Hattie came over in the afternoon and helped me on my black silk waist. After supper Mother and I went over to the Flats awhile. Saturday August 20th 1892 I sewed all day on my waist and some other things I was doing. Hattie was over in the afternoon and helped me. It looked very much like rain but Will and I went to town a little while in the evening. Sunday August 21st 1892 I was busy about the work all forenoon as I had neglected things yesterday. Will and I were over to Marys in the afternoon and rode over to see the "Flats." The folks were over from town in the afternoon. I done some picking up in the evening of things I wanted to take with me. Sadie came this evening. Monday August 22nd 1892 I got myself ready and things packed up after breakfast while Mother and Sadie done up the work. They began drying corn this morning. Will walked over town and the hack came for me. Mary Woolf went as far as Rock Island with us. We had a quick ride to Joliet but did not get down to Dwight till nearly eight oclock. We got a room at Mrs McLanes. weather warm. Tuesday August 23rd 1892 We got up early and took a walk. After that took breaskfast at the restaurant. We then went to see Ketchum & Smith about the house and on out to see the tenant about what repairs were needed and they were less than we thought for There is not the stir these was in Dwight.